largest economy by 2010. Growth rates in India of over 8% are also expected. through 2040, with China becoming the world’s largest economy by 2030.
are attempting to leverage their business strategies across China and India. co-leveraging, but to date, little co-leveraging has actually taken place. a similar product portfolio to both countries. sectors, especially durable consumer goods. resident in China or India to achieve a competitive advantage. We will elaborate on each of these themes in our future postings. Beijing is at loggerheads with the rest of the world on issues from the Chinese currency to the Nobel peace prize but on one point all the world agrees: Chinese consumers should spend more. The answer could have implications beyond the auto industry: Beijing has vowed to change the structure of the Chinese economy to boost the share of domestic consumption, and car sales are a barometer for that plan’s progress. Last weekend’s meeting of Communist party leaders underlined that the main goal of policy is to boost the share of the economy that goes to household incomes, reducing the dependence on investment and exports. Consumption increased as a percentage of gross domestic product last year for the first time in nearly a decade but it has been hard to tell how much of this shift was caused by stimulus measures. Analysts are looking to the car industry for signs of whether the consumption boost is sustainable. At the Ming Qu Auto Trading company in the Shanghai suburbs on Thursday, just as news emerged that Chinese economic growth had slowed to 9.6 per cent in the third quarter, sales manager Ji Minxiang says government stimulus had only a temporary effect on sales – and often not the one it had intended. He says Chinese consumers typically react perversely to tax cuts: they buy when taxes are rising and stop buying when taxes are falling – on the grounds that it is silly to buy until prices have hit rock bottom. So sales of the Geely Panda mini-compact car from his showroom grew when taxes rose at the end of last year. He hopes rumours of another tax increase at the end of this year will spur another rally. But either way, Mr Ji and auto industry analysts in China all agree: government stimulus measures in China are marginal: Mike Dunne of Dunne & Co, an Asian auto consultancy, says last year’s tax cuts were only a “minor event in the spectacular surge in demand that began in 2002”, driven by urbanisation, infrastructure development and low penetration of car ownership in China. China’s car market has grown at a compound annual growth rate of more than 30 per cent for the past decade, says Bill Russo of Synergistics, a Beijing auto consultancy, and former head of Chrysler in China. Last year’s 40 per cent-plus growth was accelerated by stimulus measures, “but this is by no means the fundamental driver behind the growth over the past decade”, he says. Ivo Naumann, head of Alix Partners Shanghai office, says car penetration in China is still very low, even compared with emerging markets such as Brazil and Russia. China’s light vehicle penetration is only 30 per 1,000 people compared with 206 per 1,000 in Russia and 559 per 1,000 in Italy, he says. Further car industry growth will be driven by the fact that more and more households are passing the minimum income threshold to afford a car, with this number expected to double in the next five years from 35m to 70m households. JD Power, the auto consultancy, says China car sales have surpassed expectations so far this year, in spite of the partial withdrawal of tax cuts at the end of last year, causing them to raise their forecast for 2010 to more than 18m units. The government stimulus did have a role in overcoming a temporary attack of caution on the part of Chinese car buyers during the most uncertain months of the global economic crisis. “The December 2008 stimulus and tax breaks gave consumers a fresh dose of confidence to move ahead with planned purchases . . . But such incentives were sideshows to the big picture – sustained, explosive hunger for new cars,” says Mr Dunne. Soaring automotive demand in China – which saw January-June sales jump 48% year-on-year to 9.03m units – presents opportunities and challenges for global steelmakers. Bill Russo, senior advisor to consultants Booz & Company, notes that car sales in China reached 13.64m units last year and seem set to reach 17m this year, another record high. “China will become the world’s largest auto market – forever!” Russo told delegates at the World Steel Association conference in Tokyo this week, attended by Steel Business Briefing. At China’s current rate of development and fuel consumption, by 2020 the country will have over 150m vehicles on its roads and petroleum consumption will exceed 250m tonnes. Russo says Beijing is aware of the environmental implications of this and is working to promote development of fuel efficient cars, electric vehicles and other technologies. The implication for the world steel industry, Russo argued, is that steelmakers must cease seeing themselves as mere suppliers of steel and become closer partners with car companies, which are increasingly relying on steel mills to deliver advanced vehicle technologies. For example, he notes that by 2015, Chinese steelmakers will be supplying 71% of a car’s body structure, compared with just 45% today. Russo cited the example of Baosteel’s partnership with Chinese automakers, including Geely, Chery, Dongfeng and Chongqing Chang’An in a RMB 500m ($75m) project to develop stronger and lighter materials. Faced with scarce oil supplies and polluted cities, Beijing has ordered its booming auto industry to make a great leap forward in technology. crisp Saturday recently, tens of thousands of eager new auto buffs have swarmed the opening of the Chengdu auto show. The would-be buyers pack into eight airplane-hangar-size structures filled with hundreds of sparkling new models being shown off by young Chinese women in cowboy hats and purple hot pants dancing to techno music. Leaning against the SUV, the 43-year-old explains that "status is the most important thing when buying a car," and that the Japanese, Korean, and Western brands have the most cachet. "The quality's not there for Chinese cars," he says through a translator. That's why foreign brands here often command twice the price of a homegrown vehicle. Has he considered waiting for a Nissan Leaf, the all-electric car set to go on sale in China next year? "Yeah, I've heard of it, and we know the environment is important," he says. "If it works, I'd like to buy one." Li is not alone. A recent survey by Ernst & Young found that 60% of the respondents in China show a strong interest in purchasing an electric vehicle (EV) -- nearly five times the number in the U.S., Britain, Germany, and Japan. That's good news for Beijing, because if the Chinese government has its way, buyers like Li will soon be going electric in big numbers. China has just launched an Apollo moon shot of sorts: The government recently decreed that 5 million electric cars will be traveling the nation's roads by 2020 -- up from basically none today. According to banking giant HSBC, that will equate to 35% of the global electric-vehicle market. Building an electric-car infrastructure won't be easy. Vehicle makers must work with a jumble of different players -- from the utilities, which will provide the power and smart-grid networks, to local governments, which will provide public charging stations. Standards must be set. But China, an authoritarian state, is particularly well positioned to help make the electric car a reality. "China's government is supporting electric-car technology more than any other country on earth," says Kevin Wale, head of GM China Group. The money is already flowing. Beijing has pledged roughly $17 billion to the effort. That total includes funds for R&D and the installation of charging stations as well as subsidies of as much as $8,800 to electric-car buyers in 26 cities. The provincial governments will chip in billions more, offering automakers cheap land, and consumers additional subsidies. Already every major Chinese car company either is about to launch an EV or has built prototypes. At the Beijing auto show last spring, manufacturers unveiled some 95 electric models. Chery, one of the largest Chinese automakers, recently completed a $500 million R&D center in Wuhu, dedicated in large part to electrics. "The EV will be seen as high tech and fashionable by the young generation of Chinese," says Yin Tongyao, Chery's president. "I'm optimistic that the market will take off." The multinationals, of course, want a piece of this potentially enormous market. VW has vowed to be the leading electric-car maker in China and hopes to put an all-electric version of its Lavida sedan on the market within the next three years. GM will start selling its plug-in hybrid Volt in China next year and is building a small all-electric with its Chinese partner, SAIC. But anyone who wants to get in had better hurry. It's clear that Chinese automakers are racing ahead on electric technology. And China's state-owned utilities and giant oil companies are rushing to build the smart grid and charging infrastructure to make it a reality. Hu Zhaoguang, a vice president and the chief energy specialist at State Grid, China's largest utility, which provides 85% of the country's power, puts it simply: "Electric cars will grow fast in China because the government wants them to," he says. "In the next five years growth will be very rapid." But the biggest reason for Beijing's dramatic action is that China needs to kick its oil addiction. This country of 1.3 billion has about 19% of the world's population but less than 1% of its oil reserves. It currently imports about two-thirds of its oil. And at about $4 a gallon, gasoline is expensive -- especially in a country where the per capita income is only $2,800 a year. Add a rapidly growing car fleet to the mix, and China's need for oil is poised to skyrocket. According to IHS Global Insight, this year the Chinese are on track to buy 16 million new vehicles -- about 40% more than will be sold in the U.S., now the world's second-largest market. That's 41% growth over 2009. As the base gets larger that growth rate will slow, but even so, experts expect that the 65 million cars and trucks on China's roads today could increase tenfold by mid-century. Where will all the gasoline come from to power those vehicles and at what price? Says Oliver Hazimeh, a partner at consulting firm PRTM: "It most likely will be cheaper for China to subsidize the cost of electric-car batteries than to secure the oil supply." No wonder Beijing is moving fast. The typhoon that has engulfed the southern coast of China on this afternoon is lashing rain onto the highway that leads from downtown Shenzhen to the airport. That, however, doesn't keep Lu Shi Ming, a taxi driver with 16 years behind the wheel, from showing off his new electric vehicle. Emerging from a toll plaza, he pauses, letting the cars ahead speed off, which momentarily opens up an unclogged straightaway -- a rarity in China. Lu, 39, pushes the pedal to the floor, and his Chinese-built taxi -- an all-electric reminiscent of a Lexus RX 350 crossover in shape and size -- peels out. The acceleration, while not neck-snapping, is impressive for a big five-seater car. "I love this taxi," he says. "I'm spreading the word of green just like a moving billboard!" Since last May, Lu has been part of a 26-city experiment by China's central government. The goal: to learn the ins and outs of electric-car use. His E6 taxi is built by BYD Motors, the Shenzhen company that Warren Buffett bought 10% of in 2008 for $230 million. Buffett's stake in the publicly traded carmaker is now worth around $1.3 billion. In late September, Buffett's pal Bill Gates joined him on a visit to BYD plants in Shenzhen and Huizhou. Lu's taxi is one of more than 50 such electric vehicles on the road in Shenzhen, the first and by far the largest pilot program in China yet. The Chinese plan to deploy electrics initially in taxi companies and fleet operators. Why? Taxis and delivery vans generally drive set routes, which means easier access to charging stations. Also, city governments and big companies care more about lifetime operating costs than upfront investments. The BYD electric taxis cost around $40,000 before subsidies -- about twice the price of comparable gas-powered vehicles. But the electricity for the cars costs only about a quarter as much as gasoline for a regular vehicle. BYD has calculated that each taxi will save about $9,000 a year in fuel costs. The biggest drawback of electric taxis is range. The E6 taxis get about 120 miles per charge -- excellent by electric-car standards but not enough for taxi drivers to take passengers on a long trip at the end of a shift without getting stranded. The range will no doubt improve in future models. (Lu, the taxi driver, says about 300 miles would be ideal.) In the meantime, Shenzhen Bus, the owner of the taxis, has installed four charging stations at different bus depots around the city where the taxis can recharge twice a day. And Southern Grid, the utility that serves Shenzhen, has installed a handful of others. One goal of the pilot program is to gauge what number and combination of chargers will work best for a society that drives electric cars. China (like the rest of the world) is experimenting with a few approaches. There are so-called trickle chargers, which can take six to eight hours -- good for overnight charging or when the car is parked in the office lot. Medium chargers can refresh a battery in about an hour and a half -- convenient for taxi drivers stopping to hand over the car to the next shift. And then there are superfast chargers that take only 20 minutes -- but require huge amounts of energy -- and would be good for drivers who need to refill during long trips on the highway. The Chinese oil company CNOOC is exploring battery-swapping stations -- drive in, drop off your depleted battery, and drive off with a fresh one in less than a minute. Yasuaki Hashimoto, the president of Nissan China, believes that swapping may work for buses that have fixed routes and a standard battery. He worries that it won't work as well for passenger cars where each battery has to be designed to fit with different body shapes and vehicle weights. Says Hashimoto: "How could one swap station hold all brands of battery?" Shai Agassi, the founder and CEO of Better Place, a startup that has raised $700 million and is building a battery-swapping and charging station infrastructure in Israel and Denmark, disagrees. (Better Place also has a partnership with Chinese automaker Chery, which has a prototype car with swappable batteries.) "Our swapping stations," says Agassi, "could easily handle five different kinds or more." Agassi argues that China is the perfect place for swappable batteries because most urbanites live in highrises without easy access to charging stations. Also, Beijing seems to favor swapping over superfast charging, which can add strain to the grid. To reduce the high purchase cost of electric cars, Better Place plans to own the expensive batteries and sell miles to consumers, much as phone companies sell minutes to mobile customers. As economies of scale kick in, says Agassi, an electric car could sell for $3,500 less than a gasoline version. "At that point China will hit a tipping point," he says. "I think everyone is going to be surprised at how fast this is going to unfold. In 10 years China will be a 100% electric vehicle market." Agassi may be a tad optimistic, but there's no doubt that every car company operating in China believes electric is the future. The question is, Who will dominate this burgeoning market for electric vehicles? Right now it's up for grabs. According to the consultancy Booz & Co., about 120 auto companies are operating in China, although the top 10 control 83% of the market. The industry breaks down into three main sectors: There are the big state-owned companies such as Shanghai Automotive Industry Corp. (SAIC), FAW Group, BAIC, and Chang'an. There are independents like BYD, Great Wall, Geely (which recently bought Volvo), and Chery (which is owned by the local government in Wuhu but is scheduled to be privatized). And there are the multinationals: Daimler, GM, Hyundai, Toyota (TM), VW, and more. To operate in China, foreign companies must form joint ventures with Chinese companies. GM and VW, for example, have joint ventures with SAIC, yet SAIC also sells cars under its own brand. Currently the nimbler independents -- BYD, Chery, and Geely -- and the foreign carmakers lead in market share for gasoline-powered cars. The big government-owned carmakers such as SAIC and Chang'an will have to scramble to keep up as China shifts to electric vehicles. "They're too high-cost and too slow," says Marco Gerrits, a former Daimler auto engineer and a consultant with Boston Consulting Group in Beijing. "Because they're controlled by the government, they can't fire people." There's a danger that in its zeal to create an electric-car industry, the leadership in Beijing is pushing the state-owned companies -- whose gasoline cars are of below-average quality -- to make electric cars before they're ready to tackle such new technology. Gerrits believes that if the foreign companies play the game right and don't alienate Beijing, they could capture half the electric-vehicle market -- roughly what they have of today's car market. Before it can take the lead in electric cars, China has some catching up to do. Right now U.S. engineers are competitive with those from Japan, Korea, and Europe when it comes to electric-car technology, and are generally superior to China's engineers when it comes to designing sophisticated battery-control systems and integrating them into cars. GM's Volt, for instance, is an impressive -- if costly -- display of hybrid technology. Both Daimler and Toyota have formed partnerships with Tesla (TSLA), the California electric-car company that raised more than $200 million in an IPO earlier this year, to learn the secrets behind the battery technology that powers its $109,000 roadster. But unless the U.S. acts decisively, its edge is not likely to last long. While China is setting an industrial policy to dominate the electric car industry, the U.S. government is largely depending on the free market to develop and launch the technology. Yes, the Obama administration has earmarked roughly $5 billion of stimulus funds to help American automakers develop alternative vehicles and to install charging stations in selected cities. The White House predicts that the U.S. will have the capacity to produce 40% of the world's advanced vehicle batteries by 2015. The administration's investment, however, is dwarfed by what the Chinese will spend. And with gasoline still relatively cheap in the U.S. and carbon regulation uncertain, getting American consumers to accept expensive green cars will be a steep climb. No matter how things turn out, it's likely that electric cars in the future will be assembled in the U.S., simply because it's expensive to ship heavy batteries over the ocean. The real question is whether in 10 years the U.S. will be a world leader in electric-vehicle technology and thereby benefit from tens of thousands of high-value engineering and design jobs. One area where Chinese carmakers may have an advantage in this competition is in lithium-ion batteries -- a key strategic technology for electric cars. When the U.S. ceded consumer electronics manufacturing to Asia starting in the 1980s, it also sacrificed some of the expertise necessary to build the batteries to power all those cellphones and laptops. According to a study done by Intel, 33,200 people work in lithium-battery production in China today. In the U.S. the number is only 1,100. Chinese companies such as BYD already make some of the cheapest car batteries in the world. However, Kevin Czinger, the CEO of Coda Motors, which will launch an electric five-seat sedan in California this winter, doesn't buy the idea that the Chinese have a technological edge. (For more on Coda, see: A new American electric car, via China.) Czinger explains that the real challenge with an electric car is to get all the systems -- the battery, the electric motor, the cooling systems -- working together. The car needs to perform well whether starting up when it's zero degrees in Minnesota or 100 degrees in the Mojave Desert. Ever since GM built the EV1 electric car in the 1990s -- the subject of the documentary "Who Killed the Electric Car?" -- American automakers have had serious in-house programs to develop electric technology. "American engineers know how to do this, compared with the Chinese," says Czinger. "It's like the difference between having played chess once and having played it 20,000 times." China shouldn't be underestimated, however. "The Chinese are building passenger jets and bullet trains," says Better Place's Agassi. "Do you think they won't be able to figure out how to build an electric car?" One of the best examples of their rapid progress is fast-growing Chery, which is on track to sell more than 600,000 gasoline-powered cars in 2010. This fall Chery will launch an all-electric subcompact in China. A version with a swappable battery will follow. Yin, the company president, says he is hiring engineers from around the world for his new $500 million research center. He believes that when the electric vehicle hits the economy of scale offered by around 500,000 cars, the costs will become competitive with gas-powered cars. "We have to do this for competitive reasons," says Yin. "This is the future." As China begins to build the electric cars, smart grids, and charging stations to transform its auto industry, one important question hangs above the effort: Will the public buy these New Age vehicles? The car companies have already begun the marketing effort. GM, along with its Chinese partner SAIC, built a massive pavilion at the Shanghai World Expo -- the world's fair that has attracted some 70 million visitors this year -- with the theme "Drive to 2030." Inside, an IMAX-like movie explores what life with the electric car could be like 20 years from now. Podlike "personal" electric vehicles guide themselves to their destinations accident-free. The skies over Shanghai are clean. The traffic is moving swiftly. 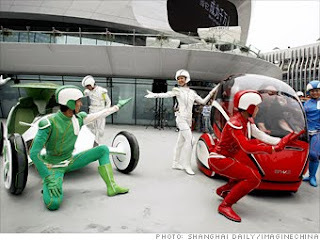 When the film ends, a strobe-lit celebration begins with dancers in jumpsuits and crash helmets who swirl around prototypes of the cars of 2030 -- imagine a cross between Tron and Kung-Fu Panda. Of course, visions of the future often miss the mark. (Weren't we supposed to have flying cars by now?) And it's too soon to tell whether the Chinese will buy into the government's master plan. But one metric suggests they're at least open to the idea: The wait to get into the exhibition hall? More than two hours.